Home Tags Posts tagged with "Bedroom Design Ideas"
If there’s one space in your home that it’s important you get the design right for it’s your bedroom. Your bedroom should function as a haven for rest, relaxation, and great quality sleep. You may not realize how much the design of your bedroom has to do with your sleep, but it could truly make all the difference. If your bedroom design isn’t optimized for your relaxation, you may have trouble falling asleep, staying asleep, and waking up refreshed. Don’t sacrifice your sleep quality. Make an evaluation of your bedroom today to make sure it properly designed for your best nights of sleep. The choices you make about your lighting will be critical in your bedroom. For one thing, you don’t want any light sources disrupting your peaceful sleep in the middle of the night. Choose thick, blackout curtains that will help keep your room a dark den at night. If you’re worried about black curtains cramping your style, don’t panic! There are plenty of options for solid curtains that block out light that aren’t even black so you can find the ones that work best for you. While we’re on lighting, we’ll remind you that harsh lighting from lamps or overhead light fixtures in the evening will not be conducive for your winding down. Find soft light lamps for your evenings and considered using recessed lighting rather than large overhead fixtures. If your walls could talk, they would tell you that hot pink and bright blues are not ideal for your sleep. You probably haven’t chosen those colors for your bedroom anyways, but in case you have kids with bold choices you should know that it may disrupt their sleep. 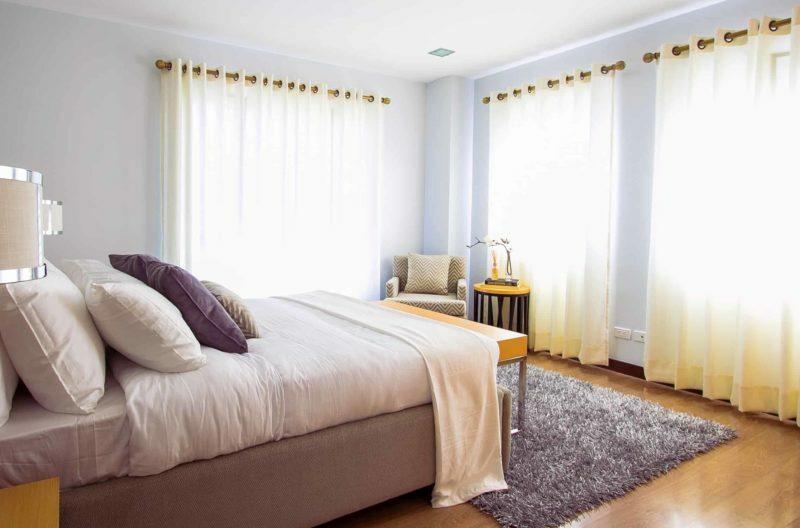 While it is still up for debate whether warm or cool tones are the best for your bedroom, everyone agrees that something neutral is the best way to go. Consider light shades of tan, cool and soothing blues, or an airy shade of gray. Including many crazy patterns into your design can subconsciously stress you out. Avoid including too many patterns in your bedroom, otherwise you may not be able to fully relax. Your bedroom isn’t the place for polka dots, stripes, and zig zags. Instead, stick to plain, neutral decor. Need a bit of flare? Add some plants! Not only will they liven up your design, but they also help eliminate toxins in the air which in turn improves your sleep. If you didn’t think too hardly about your bed when you picked it out, you’ll start having some serious regrets down the line. A proper bed is critical to a good night’s sleep. Sure, maybe it seemed reasonable when you purchased it to skimp on the size for the sake of pinching a penny and keeping some extra floor space, but if you can’t stretch out and get cozy your sleep quality will suffer. Be more thoughtful about your bed choice so you can rest comfortably all throughout the night. If you don’t know anything about feng shui, you’re already behind. Don’t worry, we’ll help catch you up. According to ancient Chinese principles of feng shui, you’ll allow for the best flow of energy if you place your bed in the “command position” in your room. This means positioning it away from the door but in a place where you can view the door. You should also leave room around the sides of your bed rather than shoving it in a corner. Take the time to rearrange your room if needed to allow for the best energy flow and your best chance at a great night of sleep. If you make conscious efforts to avoid these critical design mistakes, you’ll be able to make the sleep haven of your dream!